When using opioids one has to realize that this group of ligands, besides their beneficial analgesic effect at the same time also induces a detrimental respiratory depression. This is a mayor drawback when using opioids in acute pain and is directly proportional to their analgesic potency. For instance a potent opioid such as fentanyl already is able to induce respiratory depression in the lower dose range. However, a less potent opioid like codeine or tramadol, even when given in dosages higher than their therapeutic margin, will not induce a clinically relevant respiratory depressive effect (Figure II-34). 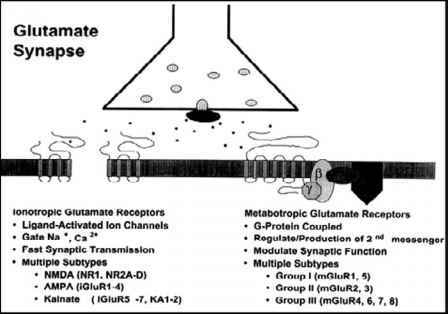 Because opioids given for alleviation of chronic pain are given orally and in a controlled release formulation, there is no acute rise in opioid plasma level, which otherwise would induce respiratory impairment. In addition, chronic pain patients cannot be considered as being opioid naive. Their respiratory center already has developed some degree of habituation, being less sensitive to the opioid agent. Those opioid ligands, which inherit a lesser respiratory depressive effect, however, are characterized by a comparable reduced analgesic potency. Also, a pure ^-type ligand such as morphine, fentanyl or sufentanil is characterized by a dose-related decrease in respiration until total apnea becomes apparent. 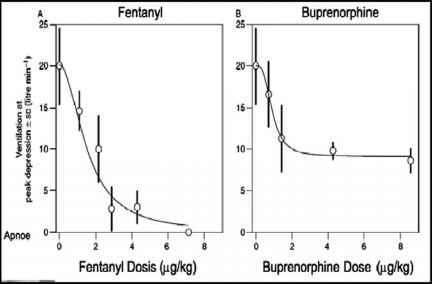 Contrary, the potent partial agonist buprenorphine with increasing doses demonstrates a ceiling effect, which is seen at a dose of 2 ^g/kg (Figure II-35). 1. A reduction in respiratory rate (bradypnea) with a partial compensation of tidal volume. 2. A respiration, which is only kicked off by external stimuli, such as noise or pain. 3. 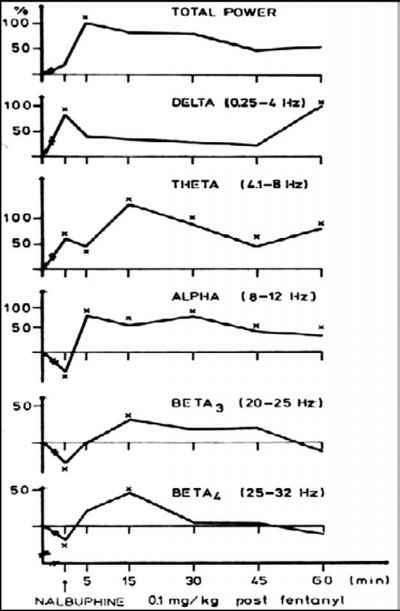 A short period where respiration is forgotten, originally termed in Europe as "oublie respiratoire", as it was observed in the early times of neuroleptanesthesia when using fentanyl together with a neuroleptic agent for the induction and maintenance of anesthesia. 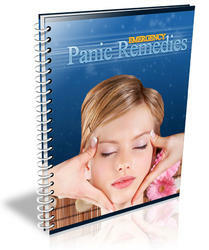 At this stage, however, the patient can be ordered to take deep breaths. 4. The total apnea, where in spite of any external stimuli or the command to breathe the patient spontaneously will not be able to take a deep breath. He needs immediate respiratory assistance. This centrally-induced opioid-related respiratory depression is due to a blockade of the respiratory regulating centers within the brain stem (pons and medulla), resulting in a lesser sensitivity to an increase in arterial pCO2 and/or a reduction of arterial pO2 [39, 40]. In addition the activating reticular system (ARS), which descends down into the brain stem, acts as a regulatory pacemaker for the inspi-ratory center, by which respiratory depressive effect of opioids are affected. This is reflected in the clinics when in addition to an opioid a benzodiazepine is added, which by depressing vigilance, results in an immediate cessation of respiration . Any opioid-induced respiratory depression instantaneously and effectively can be reversed by the administration of a specific opioid antagonist such as naloxone. Because of the higher affinity of the antagonist, naloxone displaces the agonist from the receptor site (competitive antagonism), and after binding respiratory depression is reversed and normal ventilation is instigated (Figure II-36). During reversal one should consider the half-life of naloxone, which is between 20 and 30min [42, 43]. Therefore "remorphinisation" with a reoccurrence of respiratory depression may appear if the half-life of the agonist is longer than the antagonist, or if high concentrations of the agonist are still circulating in the blood plasma . Following successful reversal it therefore is mandatory to administer an additional dose of naloxone intramuscularly, which acts like a depot, or hook the patient up to a continuous intravenous drip of a naloxone solution, sufficient for long-term receptor occupation by the antagonist. All these procedures, however, do not replace the need for a continuous surveillance, which is necessary in order to detect any possible gradual development of respiratory impairment. After 30-45 min total i.v. dose now i.m. Further surveillance in the recovery room! Figure 11-36. Titration of opioid-related respiratory depression with naloxone until normal respiration activated naloxone [47, 48], while the lesser antagonistic potency results in a more gradual and not in abrupt displacement, resulting in lesser sympathetic overdrive  (Figure II-37). Another pure antagonist, nalmefene shows the longest duration of antagonism with up to 8 h of action . Because of its high antagonistic potency (2.5-fold of naloxone) an acute abstinence syndrome can be induced if the necessary dose is not titrated to patients need . Table 11-8. 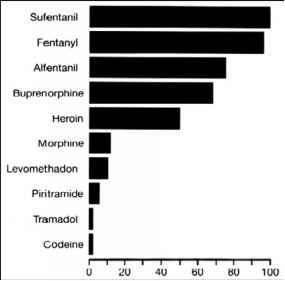 Difference in analgesic and antagonistic potency of some mixed agonist/antagonists when compared to the pure agonist morphine (= 1) and the pure antagonist naloxone (= 1).